Sigma-Delta Modulators (SDMs) have become one of the best choices for the implementation of analog/digital interfaces of electronic systems integrated in CMOS technologies. Compared to other kinds of Analog-to-Digital Converters (ADCs), Σ∆Ms cover one of the widest conversion regions of the resolution-versus-bandwidth plane, being the most efficient solution to digitize signals in an increasingly number of applications, which span from high-resolution low-bandwidth digital audio, sensor interfaces, and instrumentation, to ultra-low power biomedical systems and medium-resolution broadband wireless communications. It includes a more detailed explanation of Σ∆Ms implemented using Continuous-Time (CT) circuits, going from system-level synthesis to practical circuit limitations. It provides more practical case studies and applications, as well as a deeper description of the synthesis methodologies and CAD tools employed in the design of Σ∆ converters. 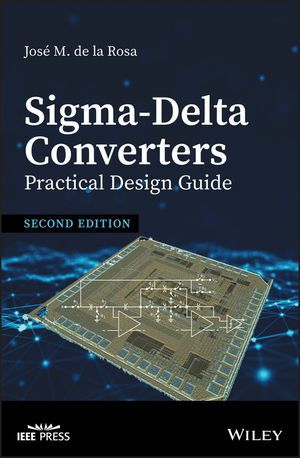 Sigma-Delta Converters: Practical Design Guide, 2nd Edition serves as an excellent textbook for undergraduate and graduate students in electrical engineering as well as design engineers working on SD data-converters, who are looking for a uniform and self-contained reference in this hot topic. With this goal in mind, and based on the feedback received from readers, the contents have been revised and structured to make this new edition a unique monograph written in a didactical, pedagogical, and intuitive style. José M. de la Rosa is a Professor at the Institute of Microelectronics of Seville, IMSE-CNM (CSIC, University of Seville, Spain). His main research interests are in the field of analog and mixed-signal integrated circuits, especially high-performance sigma-delta converters. He has worked in a number of international research and industrial projects and has co-authored over 200 peer-reviewed conference and journal papers dealing with sigma-delta ADCs. He served as Associated Editor of the IEEE Transactions on Circuits and Systems  I: Regular Papers, as Deputy Editor in Chief of the IEEE Transactions on Circuits and Systems  II: Express Briefs, and as Distinguished Lecturer of the IEEE Circuits and Systems Society.